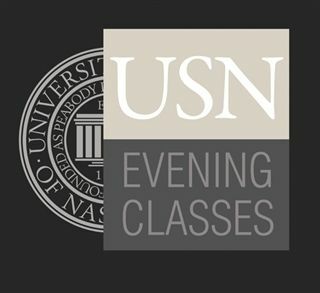 Welcome the Nashville community to USN on an upcoming Monday or Thursday evening and peek into USN Evening Classes. Please sign up to be a volunteer greeter for USN Evening Classes, our winter courses to benefit need-based scholarship endowment. Evening Classes are held on our Edgehill campus on Mondays and Thursdays through March. They require volunteers affiliated with USN (parents, alumni, faculty, and staff) to welcome instructors and students, guide them to their classrooms and answer any questions they may have. Sign up to help us out and peek into why these classes sell out year after year. 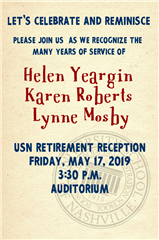 A retirement reception will be held 3:30 to 4:30 p.m. Friday, May 17 in the Auditorium for Lynne Mosby, Karen Roberts, and Helen Yeargin. 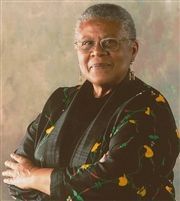 Discuss contemporary issues with and ask questions of longtime USN friend Minnijean Brown-Trickey. USNA is seeking book donations for resale during the Fall Book Frenzy to benefit the Hassenfeld Library. Please bring them to morning hook up or leave them in the USNA Office. The annual dance concert will take place Friday, April 26 and Saturday, April 27 at Vanderbilt University’s Blair School of Music. Participating in the National Day of Silence, USN High School students took a stand for LGBTQIA+ visibility and rights, both in their own community and around the world.